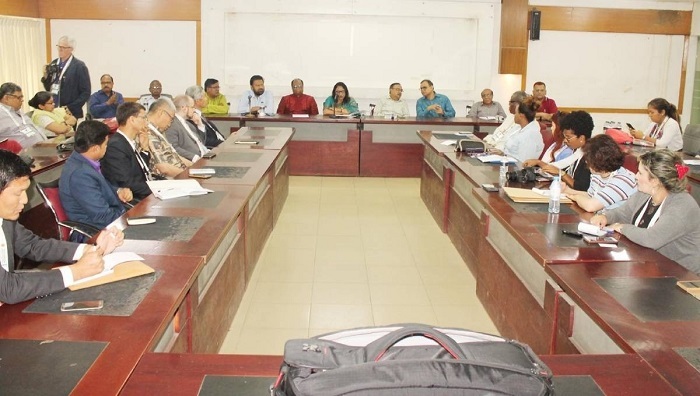 Renowned media persons, writers and litterateurs took part in a views-exchange meeting with senior Bangladeshi journalists at the Jatiya Press Club on Monday. They discussed the present state of mass media in Bangladesh and the world. Journalism and contemporary issues also came up during the discussion. A 48-member delegation, with members from 24 countries, including UK, Japan, Germany, USA, France, Australia, South Africa, Turkey, Philippines, India, Sri Lanka, UAE, Bhutan, Nigeria, Bahrain and Brazil took part in the discussion. Press Club President Saiful Alam presided over the meeting while Farida Yasmin, the general secretary, delivered the welcome speech. Former press club president Hasan Shahrier, Reazuddin Ahmed, Mohamamd Shafiqur Rahman MP, state-run news agency BSS Managing Director Abul Kalam Azad, Khandaker Muniruzzaman, journalist leader Manjurul Ahsan Bulbul, senior journalist Sohrab Hossain, Ajit Kumar Sarkar and Omar Faruk among others, spoke at the meeting. JPC joint secretary Mainul Alam, senior journalists Shafiqul Karim Sabu and Subhash Chandra Badal; members - Shamsuddin Ahmed Charu and Shahnaz Begum were also present. JPC Treasurer Shyamal Dutta moderated the event at Tofazzal Hossain Manik Mia Hall.